Master of the Grass is a well-translated collection of one eponymous novella and six short stories by Nina Gabrielyan, a Russian writer of Armenian descent. Motifs of mirrors and dreams run through these stories, and the narratives themselves are more or less dream-like, the boundary between the sleeping and the waking world kept close and permeable, even as tragic real-world events like abortions gone badly wrong intrude. 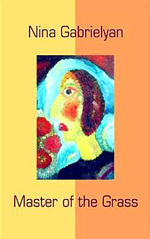 Nina Gabrielyan is a visual artist as well as a writer, and stories concerning art and artists bookend this collection. The opening novella, "Master of the Grass", tells the story of a young poet who, like Narcissus, values his relationship with the figure who appraises him each time he looks in the mirror, above that of his relationship with the young female artist he falls in love with—a woman obsessed with insects. The figure in the mirror is a handy source of justification and exoneration as the narrator treats the fragile Polina worse and worse. I think this story would have worked better as the last rather than the first piece in this collection. "Master of the Grass" dragged a little for me, whereas the next five stories in the collection are fine examples of narrative economy, delicately balanced on the edge of the real. This passion for transformation was perhaps the greatest of my passions. Tonya was a redhead, with short hair, and always stayed over. In the night you could hear her through the wall moaning and crying out. She apparently had terrible dreams. It is the narrator's passion for transformation (into her mother, into the Russian girl she would like to be rather than the Armenian girl she is), and it is Nina Gabrielyan's skill in effecting such transformations, that make this story so memorable. A strip of blue light flickers and glints on a jug: a gateway to another space, a blue mystery which you could never seize with your bare hands—even if you were to break the jug. Even the stories I liked least in Master of the Grass are still worth reading, while the best stories here are worthy heirs to Gogol and to Tolstaya. If you like to see the world reflected in new ways, I recommend this collection.